happily grants him his freedom, her fiery beauty and resilient spirit hold him captive. In fact, John has no intention of letting her go. Her fate is now in his hands, but will her heart be safe there as well? Well what can I say about this book, just that it was fantastic and absolute pleasure to read. I will definitely be reading more of Sara's books in the future. I can highly recommend this book. There is a reason for John disappearing for four years but I'm not going to reveal it, I will give my thoughts on John and Emma. The last time John The Duke of Worley saw Emma she was seventeen and he was Viscount Brantwood when she looked at him wide-eyed and mute (well you would too if your father had just announced your betrothal and just met the man he intended for you to marry), well Emma was seventeen and the Viscount had made it plain he disliked her. After that encounter the Viscount disappeared presumed dead and in that time Emmaline's parents died and she went to live with her much beloved aunt and uncle and the Viscount's father also died and he then became the The Duke of Worley. 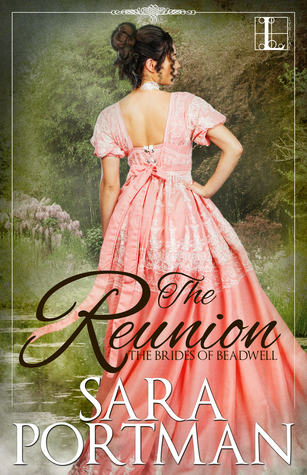 So four years later Emmaline is at a ball when she overhears gossip from Lady Wolfe and her gaggle of clucking matrons (Emma's words not mine), about the sudden return of The Duke of Worley. (you will get to know more on Lady Wolfe further in the book). John is also at the ball with his best friend Hugh Brydes (Hugh knows the real reason why John disappeared and has kept the secret), and is looking for a wife completely forgetting he already has a fiancee. When John finally does meet Emma he doesn't even recognise her much to her annoyance, if it wasn't for Emma's aunt he wouldn't even had a clue. In a private conversation Emma says the best quote to John. Is your ego really so bruised you would punish me by threatening to push forward with this ridiculous engagement? You would bat me around like a cat's toy just to remind me of your superiority. All I will say from here is that there is the cat and mouse chase (not that John or Emma are a mouse) and eventually they do get married were Emma strikes up a bargain. This story does pull at your heart in more ways and sometimes I wanted to shake either John or Emma because you can see were they are going wrong. John is arrogant but he has is reasons, mainly he doesn't want to be like his father who pushed his mother away and John doesn't want to get to close to Emma just in case he does to her. This is were I wanted to shake him because I could see he was completely different to his father, John had a heart his father didn't. Emma doesn't want to marry John, she wants to live as a spinster in her cottage that she inherited when her parents died and look after the garden that her mother worked on. Again I could see this would be a big mistake for Emma and again I wanted to shake her and see sense that John is really good for her and luckily she finally agrees to marry John but it had to be a marriage of convenience. As I said before this was a fabulous book and one I can highly recommend. The next book is called The Offer and this book is about Lucy who is Emma's best friend.